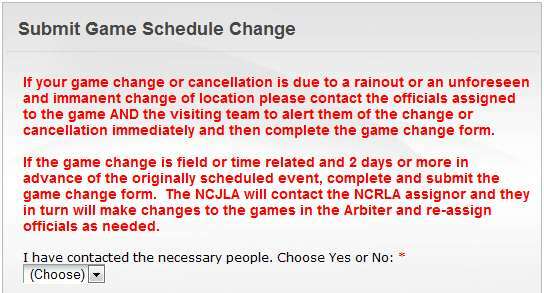 All game cancellations, reschedules and changes should be submitted through the NCJLA.org website online form. 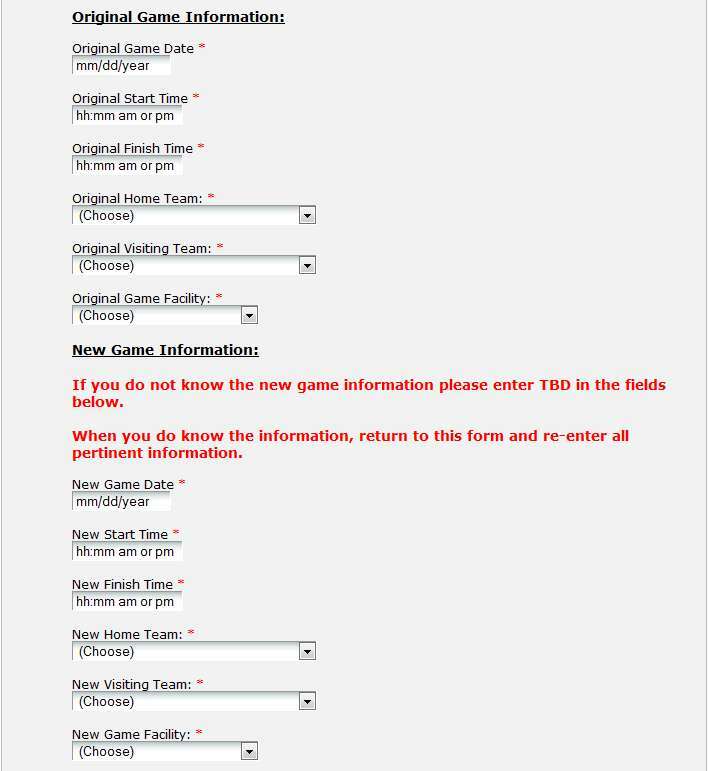 It is located under the Club Administrators tab at www.ncjla.org and the form is called Submit Game Schedule Change. 1. If your game change or cancellation is due to a rainout or an unforeseen and immanent change of location please contact the officials assigned to the game AND the visiting team to alert them of the change or cancellation immediately and then complete the game change form. You must also contact the assigner. Assigners contact information can be found on the Staff & Contacts page on the www.ncjla.org website. If the game change is field or time related and 2 days or more in advance of the originally scheduled event, complete and submit the game change form. The NCJLA will contact the appropriate assignor and they in turn will make changes to the games in the Arbiter and re-assign officials as needed. 3. After the reason is selected you will be presented with form fields requesting original game information and new game information. Please take care in entering information in the appropriate format and selecting from the dropdowns the proper teams and facility. 4. 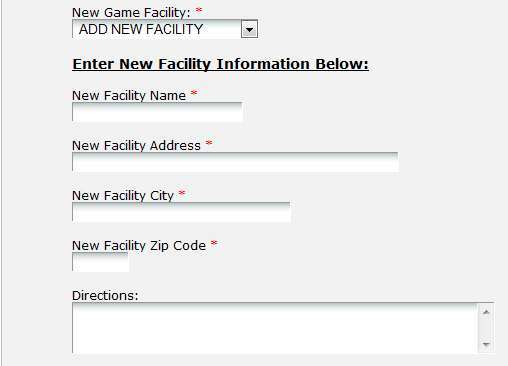 If the New Game Facility is not in the facility list, choose ADD NEW FACILITY and fill in the facility information. Weather related cancellations or reschedules must be reported within 24 hours of the original event. Games cancelled for reasons other than rainout must be reported by no later than 4 pm on the Tuesday before the desired weekend of play. Cancelled games will appear on the team’s schedule page with a line through them and with a note that says “CANCELLED.” The cancelled game will remain on the schedule. Games that can be rescheduled immediately will have a notation Rainout/Reschedule or Change/Reschedule but otherwise will appear normal. Games that are to be rescheduled will appear on the team’s schedule page with a line through them and with a note that says “Rainout/Reschedule” or “Change/Reschedule” until such time as the game parameters are updated. An email will be sent to everyone on the team roster every time there is a change to a game.